Epilepsy is one of the most common neurological disorders. Seizures in about 40% of patients with temporal lobe epilepsies are pharmaco-resistant . In surgically removed hippocampal tissue from these patients, the KCC2 cotransporter is absent or non-functional in about 20 % of subicular pyramidal cells . KCC2 normally assures the maintenance of low intra-neuronal chloride levels  and also regulates potassium levels . Chloride concentration changes in the remaining pyramidal cells due to intensive GABAergic input during seizures could reverse the effects of GABA currents from inhibitory to excitatory [5, 6]. Such changes may shift a pyramidal cell into a periodic bursting regime associated with ictal discharges. Using a detailed biophysical model of a single cell incorporating these mechanisms of ionic homeostasis and a neural network model, we show that decreasing the activity of KCC2 pump leads to repetitive seizure-like firing in the pathologic network due to increased extracellular potassium and intracellular chloride (Fig. 1). 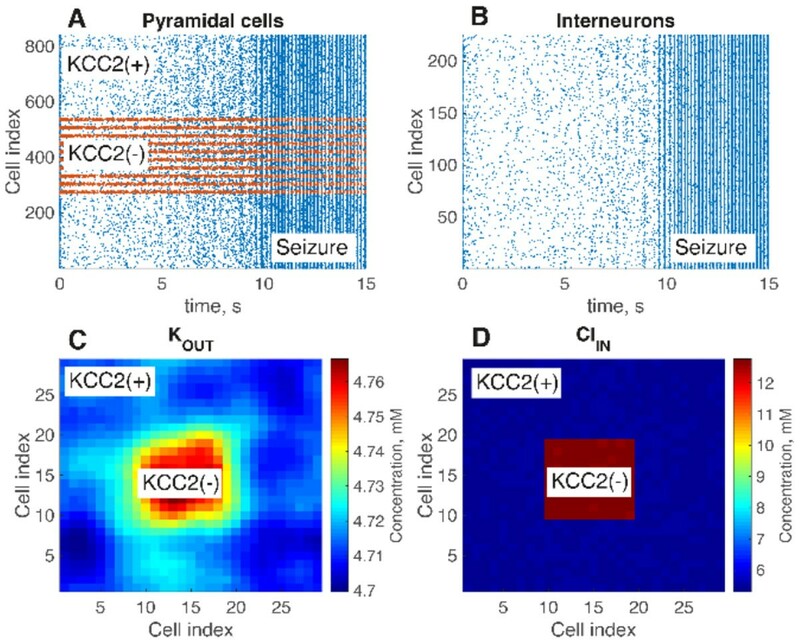 This model provides insights into how a dysregulation of pyramidal cell chloride homeostasis due to reduced levels of the KCC2 cotransporter may lead to seizures in the epileptic human subiculum. A raster plot of pyramidal cell population firing; B raster plot of interneuron firing; C spatial distribution of extracellular potassium; D intracellular chloride distribution. This work has been supported by the following grants: ANR-10-LABX-0087 IEC, ANR-10-IDEX-0001-02 PSL, ERC-322721, FRM FDT20140930942. Especially we would like to thank Giri Krishnan for useful discussions.